Before selecting carpets decide whether the architecture or furnishings will be emphasized. Assuming the architecture will be the focus point, we will select carpet early on and work it into the plan. You might choose one with unusual characteristics, then find fabrics and leathers to complete it. But, if you have an art collection with great furnishings, you will buy a carpet that is subordinate. Traditional: Traditional decor is very formal and consists of either antiques or replicas which represent the French and English influence of the 18th century. A lot of deep, light wood tones were used during that time period. Overall it is a very stately, conservative look. Generally speaking, a carpet which is formal and elegant, with a slight lustrous elements , may be what is needed to create a rich look. County: Country decor can be either formal or informal. Overall, the furniture will be plain and simple in design. Light to medium shades of pines and oaks are used in this style. Although this style can be more formal, it is primarily on the causal side, so a carpet in a more subtle color and texture will work best. It would be best to implement a berber carpet with or without patterns. Contemporary: This is more of a high fashion look with lots of glass, chrome, laminates, leathers, and bright neon colors- of which are used as accents throughout. The only carpets which will accentuate this style are those with dense, rich high luster finishes in an upscale color such as mauve, teal, or coral, amongst others. The look here is sophistication. 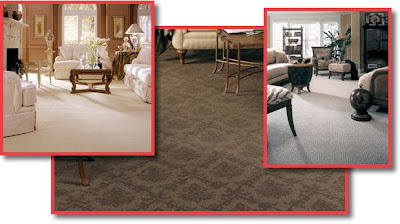 Carpet with patterns and texture patterns and dense low pile carpet with patterns are very popular now. One of the main things you always have to consider is, how much traffic will be wearing down that carpet. Do you want a high traffic carpet for the kids or would you want a designer luxury carpet? Some carpets sustain much traffic without showing marks of "wear and tear". These effects mostly depend on the brand. Another thing you might want to consider is how easy it will be to remove stains should the carpet be stained. It is of much importance to take pets and kids into consideration when purchasing ones carpet. In the case in which neither of these are factors, a carpet with less stain fighting action may be in the cards for you! There are many characteristics of carpets to choose from: Carpet With Patterns, Print Carpet, Soft Carpet, Berber Carpets, Plush Carpet, Dense Carpet, Heavy Traffic Carpet, etc. The most popular brands and also the most reliable are Shaw, Mohawk, Masland, Royalty, Couristan, Stanton, Fabrica, Fibre Works and lastly, Fabrica.